Watch the moment firefighters put out a car fire in Sussex on the hottest day of the year so far. 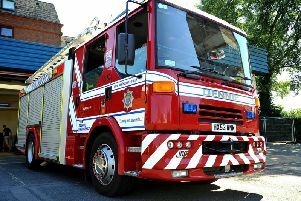 The car was on fire at the Boship roundabout in Hailsham, East Sussex, causing long traffic delays on the A22. One fire engine was sent, and crews used foam and a hose reel jet to quench the flames. Police are in attendance, a fire spokesman confirmed. The roundabout was closed while the emergency services deal with the incident, leading to long traffic delays. This comes on the hottest day of the year, with temperatures reaching 32 degrees Celsius across the county. Click here to read advice from the fire service on how to prevent outdoor fires, after 50 hectares of farmland was ablaze yesterday evening in Alfriston, East Sussex, leading to Druscillas Zoo being evacuated.